No Chelsea player played well during the Blues’ 6-0 annihilation at the hands of reigning Premier League champions Manchester City on Sunday. Maurizio Sarri’s side were thoroughly outclassed by Pep Guardiola’s men and will be embarrassed to have been on the receiving end of such a scoreline. Whilst City themselves were magnificent, a few of their goals were preventable. Chelsea goalkeeper Kepa Arrizabalaga should have been able to keep Ilkay Gundogan’s first half strike out, whilst Marcos Alonso had earlier abandoned his man, which led to the opening for Raheem Sterling to slam home the first of the game. Sergio Aguero’s second goal came from yet another error, as Ross Barkley headed the ball carelessly back into his own box, where it fell to the Argentine who made no mistake in gratefully sweeping it home into the bottom corner. 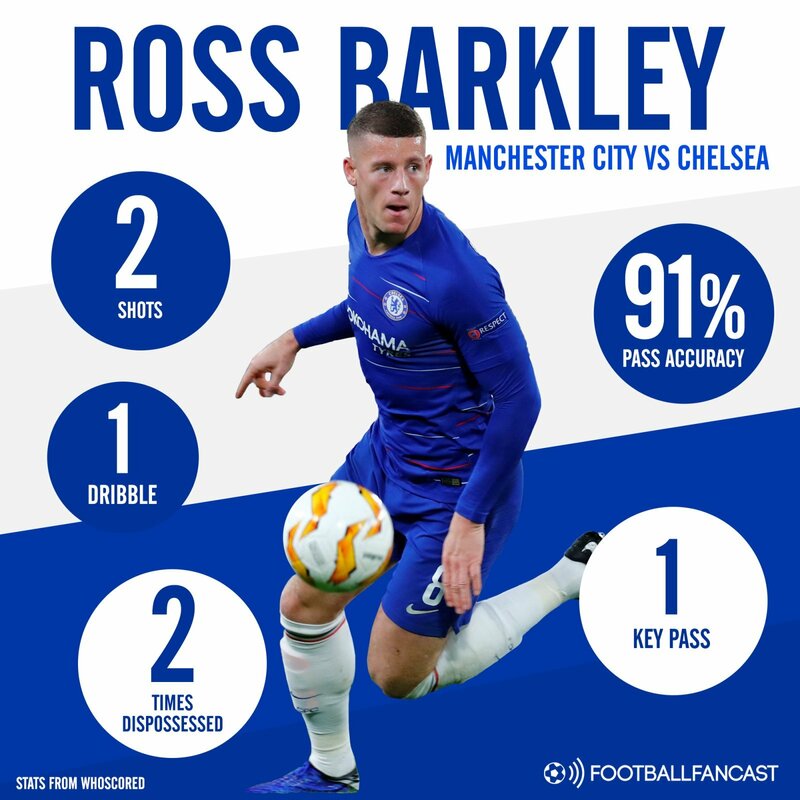 Barkley’s moment of madness will be the enduring memory of his performance at the Etihad Stadium, but there were some positives to his game that deserve recognition. The 25-year-old was one of the Blues’ most progressive players. As per WhoScored’s stats, he managed to complete one key pass and took on two shots against City, in both instances only one of his teammates was able to be more productive. Whilst such endeavours didn’t pay off for the midfielder, his willingness was laudable. On the ball, the 25-cap England international was very tidy. His pass accuracy rating of 91.2% was particularly impressive. However, he should have been more bold whilst in possession. Running with the ball is one of Barkley’s great strengths, though he only completed one successful dribble on Sunday. He was also dispossessed on two occasions, as City’s aggressive pressing overwhelmed him. It was by no means a good performance from Barkley against City, but nor was it from any of his teammates either. However, in the fight and persistence he showed whilst on the pitch – before being hauled off by Sarri in the 51st minute – there were some positives to glean from an outing that will otherwise only be remembered for his horrendous error.